‘Zoey, what is it?’ Stark said softly. Zoey is finally home where she belongs, safe with her Guardian Warrior, Stark, by her side and preparing to face off against Neferet which would be a whole lot easier if the High Council saw the ex- High Priestess for what she really is. But there are new forces at work in the House of Night. An influx of humans threatens its precarious stability. And then there is Aurox, a gorgeous boy who is actually more- or possibly less- than human. Only Zoey can sense the human compassion that wars with his Dark calling. Will Neferet’s true nature be revealed before she succeeds in silencing them all? And will Zoey be able to touch Aurox’s humanity in time to protect him- and everyone-from his own fate? He stepped off the sidewalk, moving to his right toward the edge of the main school building. Aurox kept away from the flickering gaslights. Instinctively he preferred the deeper shadows and darker corners. His senses were always alert, always searching. So it was strange that the tissue startled him. It was a simple rectangle of white. It floated on the wind, fluttering before him almost like a bird. He stopped and reached out, plucking it from the night. So strange, he thought, a floating paper tissue. Without conscious thought, he tucked it into the pocket of his jeans. Shrugging off the odd, foreboding feeling, he kept walking. Her emotions hit him after he had taken two more steps. Sadness- deep, pressing grief. And guilt. There was guilt there in her feelings, too. As he got closer- as her emotions flooded him- something unexpected happened within him. Instead of absorbing her emotions and feeding off them, Aurox absorbed them and felt. He didn’t change. He didn’t begin to morph into the creature of great power. Instead, Aurox felt. Here’s a book that stands apart from the rest in this series. Destined is incomparable and there’s no doubt about it. There’s less of cheesy romance, more of love, less girl-talk and a lot of gore. But the best part is there is no beating about the bush, and unnecessary babbling in Zoey Redbird’s head. Book 9 of the House of Night series opens doors to new worlds, all of which do not- for once- revolve around the ‘nerd herd,’ but will consequently affect them all. As Neferet appoints humans to work for the Tulsa House of Night, Lenobia- the awe-inspiring Horse Mistress- finds herself in a dilemma, with the ghosts of her past trying hard to catch up with her. Zoey and her friends get permission from the Vampyre High Council to live in the tunnels and get bussed to the school for classes. 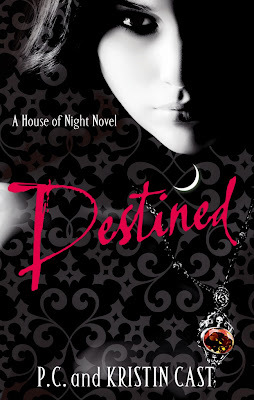 But Zoey has been toying with the idea of not just declaring the Tulsa Depot outside of the jurisdiction of the House of Night, but also of declaring herself a vampyre queen. Things take an unexpected turn when differences spring up between the most unlikely people- the Twins, Shaunee and Erin. As we glimpse the truth behind Shaunee’s past and her sudden empathy for Rephaim, we realize that sometimes even the best of friends fail to understand each other for inexplicable reasons. The need to be who she really is becomes evident in Shaunee as she tries to choose a different way- her own way- of doing what’s right. That’s the recurring theme in the novel: making the right choices… and the immense power of certain acts. It’s strange, how I always used be cynical about Zoey’s mad habit of trusting people who seemed dubious. Because, I now found myself constantly wishing that she would just follow her heart this time and CHOOSE to see the good in people, even though at least one of them has been created to destroy her. This is a tale of honour, of trust, of the courage to see with ‘True Sight’: because, sometimes there IS much more to a person, even a fallen angel, than meets the eye. This is the only HoN book i bought . Rest were e books ! I am so happy to see this post !! *dances* .. all 'cause I know FL does not like this series !! I LOVE the review Arpita. My hopes are soaring high!!!! when will i ever be away from this Zoey?? this is one series where there s no lack of action...nothn gets monotonous..nt evn the cheesy romance..thank u arpita for the review..m so gonna read it.